It's kind of sad if you think about it. If shape-shifters exist, and their skills enable them to impersonate others, then everyone else will naturally end up being paranoid. It's hard to be certain that you're really talking to the person you think you're talking to, and not an impostor. If you have an off day and act a little unlike your normal self, it would be easy for someone to conclude that you've been replaced with a doppelganger. Genocide is never a morally acceptable solution, but with the kind of paranoia shape-shifters cause, I guess I can understand why folks would get desparate enough to try it. It must be hard to live as a shape-shifter. Not only does nobody trust you, but they blame you for their feeling like they can't trust each other. Even if not for the genocide, you'd still be an outcast. Exactly the problem of shapshifters today. While the Powers That Be are starting to see reason not to harm folks anymore, it will take longer until everyone else is on board with that. Of course I don't agree with genocide in any way, it just seemed "logical". The biggest point made by shapshifter researchers is that in a community of seven species, of which only three and a half can intermarry, but love does as love does, the social structures will be deformed. Speakers have not re-discovered all spells, and a lot of natural shifters are ignorant for lack of teachers - the animal lords Giva and Chiboyé came forward to address that (article in the works). Earth lore has a rich history of shapeshifters, Odin and Loki, the animal spirits of North America, the Persian magicians, and so forth. One of my favourite fairytales has a shapeshifting duel, one turning into the hook that catches the fish and so on, it's great. Hmm... I thought I posted another comment here, but I guess it got lost. I always thought that if I could pick one super-power, it would have to be shape-shifting. It's basically a way of cheating the question: If I needed any other ability, I could turn into something that has it. Of course, that makes shape-shifters even more powerful, and therefore more frightening to everyone else. It would be interesting to see what a society would look like after figuring out a way to live in harmony with shape-shifters. How could they be integrated into society without letting their abilities give them too much power over everyone else? I guess that's one of the questions your researchers are working on. By the way, that fairy tale doesn't sound familiar to me. Do you remember what it's called? Unfortunately, Blogger seems to be quite glitchy with comments. It only works for me with Firefox, but not Opera. And sadly, I don't remember the name of the fairytale. I had a compendium as a child in which it appeared; a young man studies magic to marry, because his love's father demands "ladjeb" as dowry, which turns out to be a shapeshifter duel. Many elements are known from other fairytales, like the boy turning into a mule and asking his father to sell him on the market, but keep the reigns as to return him to his original form. 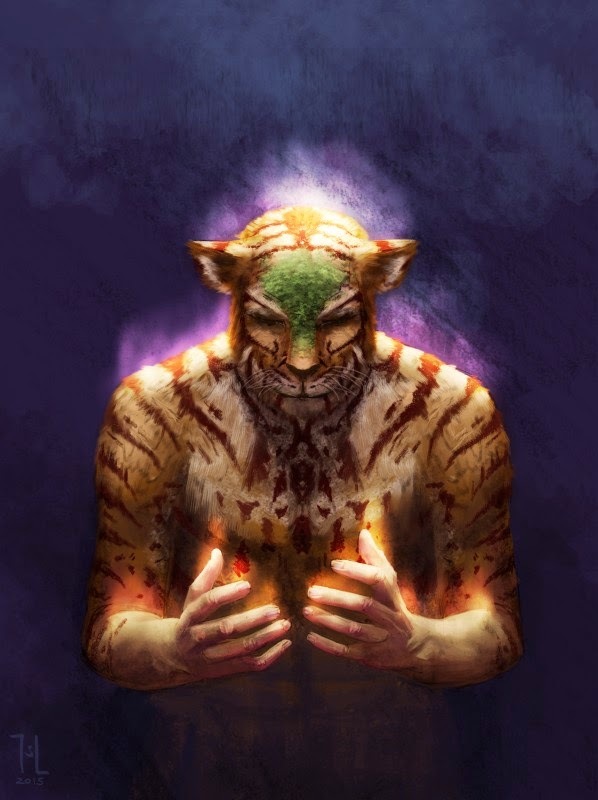 As for kitaian shapeshifters, it will indeed be very interesting to see how people will react to them. One could take it as a ray of hope that speakers are normal folks too, and they can turn into raging lunatics toward the opposite tradition at any moment; and spirit collectors are walking death traps (pun intended ;)) but still revered. I'm sure the mixed-species couples now able to have their own children are grateful for shapeshifting spells.